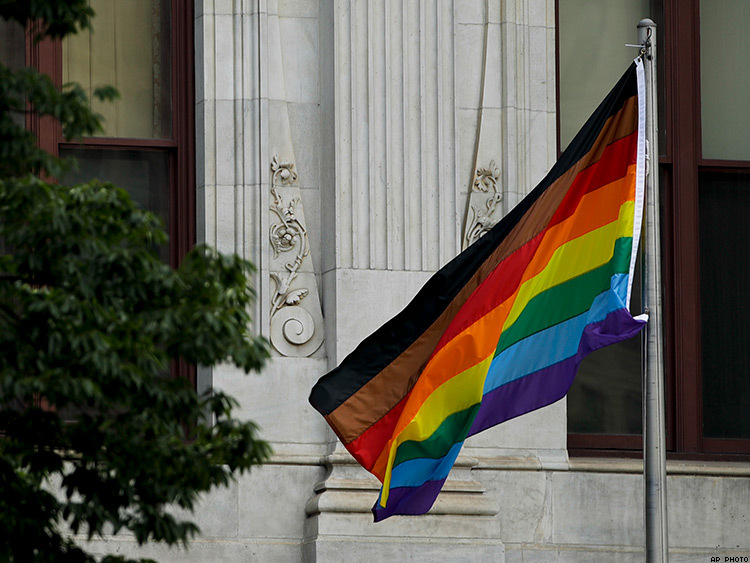 Philadelphia's inclusive flag started as a way for the city to heal after ugly incidents at the city's queer bars and clubs. It ended up sparking a national dialogue. A leaked video of a gay bar owner in Philadelphia using racial slurs sent shockwaves through the city’s LGBT community last year. But for people of color, the incident was all too familiar. “Ni-ni-ni-ni-ni----s, every one of 'em,” said Darryl DePiano, who operates ICandy, a cream-colored nightclub located in the heart of Philadelphia’s gayborhood. In a 21-second video recorded on an iPhone, DePiano repeatedly uses the epithet to describe his black customers, who he claimed attempt to grift the bar for free drink tickets. DePiano would apologize for the three-year-old recording in a Facebook post, saying that those comments no longer reflect his views, but the damage was already done. Protesters with the Black and Brown Workers Collective, an organization dedicated to liberation for queer people of color, staged a sit-in of ICandy in October, just hours after the video went viral. Joined by organizers from the Pennsylvania chapter of Black Lives Matter, the group blocked the bar area — preventing patrons from ordering their gin and tonics. “Since the 'n-----s' can’t get their free pass drinks, you can’t get a drink,” BLM organizer Asa Khalif said at the time. The most potent symbol of protest, however, was a pair of Timberlands hung on ICandy’s doors. These boots became synonymous with racial exclusion in the Philly gayborhood after the bar's bouncers instituted an unofficial dress code policy last year that denied entry to anyone wearing the brand. * People of color say these rules were designed to keep them out. The bar also banned hooded sweatshirts, an image that became permanently associated with blackness after Trayvon Martin was gunned down five years ago in Florida. Malcolm Kenyatta, who serves on the mayor’s inaugural commission for LGBT affairs, said that prior to last year, these issues were difficult to talk about in Philadelphia without being silenced or dismissed. A new Pride flag unveiled in June was designed to show that while the city can’t fix these problems overnight, Philadelphia is listening. But the response to the new flag shows just how far the LGBT community has to go. The new version of the rainbow flag added black and brown stripes to Gilbert Baker’s iconic design, which has been through several iterations over the years. The 1978 original included hot pink, turquoise, and indigo. These colors would be dropped because they were too expensive for manufacturers to produce. To memorialize those who died during the height of the AIDS epidemic, a black stripe was added during the 1980s. The Philadelphia Office of LGBT Affairs worked with Tierney, a local design firm, to bring black back to the Pride flag. But after national news outlets picked up the story, those concerns were quickly drowned out on Facebook and Twitter by fierce outcry from an extremely vocal minority of the LGBT community, primarily white gay men. Abdul-Aliy Muhammad, cofounder of the Black and Brown Workers Collective, said some critics of the Philadelphia flag “scribbled out” the black and brown stripes online. Others posted the design to social media with the word “NO” written over the flag, while others added a white stripe in protest. But people of color in Philadelphia know that statement is a fallacy. When white is treated as the default, it’s always at the expense of everyone else. Racial divides in the gayborhood were first documented more than 30 years ago in a 1986 report from the Coalition on Lesbian-Gay Bar Policies. Formed two years earlier, the coalition was intended to address what Philadelphia Magazine writer Ernest Owens called the “racial segregation at popular gayborhood bars and the practices that abetted it.” Its findings, as Muhammad explained, detailed a “culture of exclusivity” at the city’s LGBT nightclubs. That has changed little in the decades since. A 2017 study from the Philadelphia Commission on Human Rights came to the same conclusions as the earlier report. It said gay bars in the city were “preferable environments for white, cisgender male patrons.” A black lesbian cited in the report said that she frequently waited for more than 15 minutes to get a drink at the gayborhood clubs, while other patrons were served before her. Others have alleged that they are asked to show multiple forms of identification or required to open a tab before ordering their beverage — because of fears that they’ll skip out before paying. Nearly every queer person of color in Philadelphia has a story of feeling like they’re unwelcome in a scene they hoped would embrace them. Owens has written that when going out to bars, other gay men have slapped him on the behind and called him “Hot Chocolate.” Muhammad was once targeted by plainclothes police officers who said he fit the description of a suspect they were seeking. Law enforcement officials grabbed him and pulled him outside of a club. The bouncer knew Muhammad from his nonprofit work in the city and didn’t try to stop it. He said nothing. Damon Humes, executive director of Colours, which offers health and wellness services to black LGBT Philadelphians, said this has been a jarring reality to face. When Humes first started coming to Washington Square West, the Center City district that is home to many of the city’s gay bars, it was a time when queer and trans people were frequently harassed and targeted by police. Young LGBT people have long sought out the neighborhood as a safe space, but cops have a storied history of raiding gay bars and beating up patrons. That’s true in nearly every city in the United States. Such widespread brutality led to the Stonewall riots in 1969, a protest many view as igniting the modern gay liberation movement. Racism among LGBT people, however, isn’t strictly a Philadelphia problem. A 2015 report from Gay Men Fighting AIDS, a U.K.-based charitable organization, found that 80 percent of black gay male respondents had experienced prejudice in the LGBT community. The rates weren’t much lower for people of other ethnicities. Seventy-nine percent of Asian men and 75 percent of South Asian men that the organization spoke with said they had witnessed racial bias from other gay men. Numerous incidents from within the past year attest to an epidemic that may be invisible to those with the privilege to ignore these everyday realities, but the community’s race problem shouldn’t be a secret to anyone with a Grindr or Scruff account. In November, Denver’s X Bar hung a display of a Latino immigrant in a sombrero scaling a dividing wall in the club. His hands bloodied from the climb, the figure was reaching for an American flag displayed on the other side of the wall. Even while apologizing for this horrific display, the gay bar’s owners called it “satire.” Two months later, a 2012 email from J.’s in Washington, D.C., leaked in which a manager requested to erase a black athlete from a flier promoting the bar’s Olympic-themed events. During the exchange, the manager asked if the graphic designer could put a “hot white guy” on it instead. “That’s more of our clientele,” the JR’s manager explained in the email. But if space in the LGBT community continues to be denied to black and brown people, Philadelphia hopes to be part of the change. The Pride flag is just one component of a “larger push for inclusion,” Hikes said. After the Commission on Human Rights report came out, the city ordered 11 gay bars to undergo implicit bias training earlier this year. This mandate also included two health care organizations, Mazzoni Center and Philadelphia FIGHT, which were accused of denying advancement opportunities to nonwhite employees. Although black and brown people might conduct HIV testing or answer phones at the front desk, critics allege that these faces are rarely present on leadership boards of LGBT nonprofits. *CORRECTION: An earlier version of this story reported that the nightclub Woody's had a policy banning Timberlands and hooded sweatshirts. The club never had such a policy, it was ICandy, which claimed it was not an official policy. We apologize for the error.